Mama polar bear lay on her back. Her two cubs, Snowball and Icicle climbed on top of her. They giggled and tickled their mama's paws. Mama said, "Are you two ready to learn how to catch a fish?" "Yes, Mama," said Snowball. "I want to catch a fish." "But Mama, there's nothing but ice. Fish don't live on the ice, do they?" Icicle rolled over her mama's leg and fell to the icy ground. 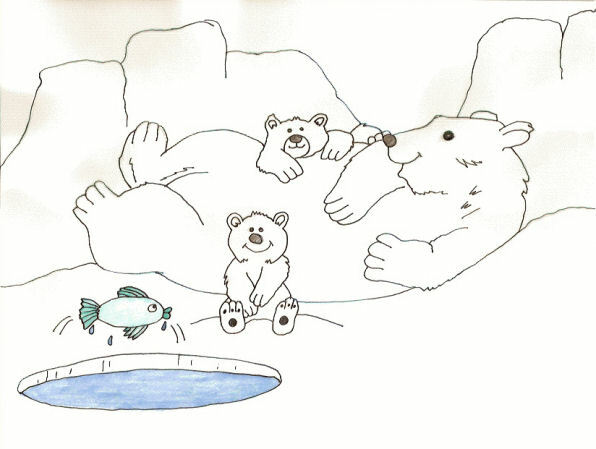 "Ah, my cubs, fish live under the ice, in t he water," she said. "But Mama, the ice is so thick," Icicle said. "Not everywhere. Come with me." Mama stood and walked across the ice. It crunched under her huge paws. She stopped in a puddle. "As you can see, cubs, the ice is not thick here. Stand back." Mama kicked a hole in the ice. Water rushed around her paws. "Look, Mama. There's water. Are there any fish?" Snowball crept closer to the hole. "The water is so dark and blue, like the night sky." "How do we catch the fish, Mama?" Icicle stuck her paw in the water. "Stay here." I'll go and catch you some fish." Mama slipped through the hole into the water. Where did Mama go?" Snowball plopped down on his bottom and stared into the hole in the ice. "Mama! Mama!" Icicle sat next to her brother. "Come back, Mama." A few minutes later Mama's head burst through the water. She held a fish in her mouth. She spit it out on the ice. The fish wiggled about, coming closer and closer to the cub's paws. "Here's a fish for you, Snowball. I'll get one for you, Icicle." Mama disappeared under the water. Snowball stood and put his paw on top of the fish. It wiggled and flipped itself about. Mama came back with a fish for Icicle and then swam back to get one for herself. They ate their fish. Mama lay on her back and her cubs cuddled close; their fat bellies full. As they lay there, fish jumped out of the water. "Next time you can catch your own fish," Mama said, closing her eyes. The cubs watched the fish leaping out of the water for a while and then snuggled against Mama and fell asleep.